DLA certified environmental and hermetic class MIL-DTL-38999 Series III and IV connectors are the most widely used and requested connectors within the mil-aero industry — and for good reason. Developed for reliability, the Series III triple-start thread prevents galling and cross-threading while providing quick disconnect, single-turn action to engage self-locking, metal-to-metal coupling. Series IV offers the industry's most robust mating with a 90 degree quarter-turn breech-lock mate with visual, tactile and audible engagement confirmation. The rugged construction of the Series IV disperses the mating force across a channeled metal flange while threaded mechanical force provides friction, locking the mates halves securely. Both series feature accessory threads and environmental sealing for reliable attachment of backshells. Scoop-proof shell design protects crimp-removable contacts from damage. Integrated plug-to-receptacle grounding and shell-to-shell bottoming delivers 65dB minimum shielding at 10 GHz. Glenair is now a qualified supplier of the MIL-STD-1560 G29 contact arrangement. Both series III and IV support all MIL-STD-1560 insert arrangements. Qualified environmental-class Series III connectors are supplied with W, F, G and T class materials and plating. Classes F, G and W are supplied for Series IV. Hermetic versions of Series III and IV are available in classes Y and N.
Industry standard and special design MIL-DTL-38999 mil-aero cylindrical connectors from the most accommodating engineering and manufacturing team in the interconnect industry — we say yes to standards and specials! High-density, push-pull, lanyard release, high temperature, ground plane, compliant pin, zero extraction force, thru-bulkhead, spacegrade, gender changers, modified flange, or any other modification needed to solve a complex interconnect challenge. Liberal policies on NRE costs, minimum order quantities and delivery schedules. Standard environmental-class MIL-DTL-38999 Series III connectors with DLA certification are now manufactured and supplied by Glenair. These industrystandard connectors are ideally suited for the broad range of harsh environmental land, sea, air, and space applications and are backed with Glenair's industry leading service, support, and availability. Marked with D38999 or Glenair COTS part numbering, these environmental crimp-contact connectors are available in plug, jam-nut and wall mount receptacle shell styles. Standard material and finish classes are supported including W (Cad/O.D. over Electroless Nickel), F (Electroless Nickel), T (Nickel-PTFE) and G (Space-Grade Electroless Nickel). Contact arrangements per MIL-STD-1560 and both normal and alternate polarizations are fully supported. Best of all, defense and commercial aerospace customers, as well as land and marine engineers and procurement specialists may now specify these missioncritical interconnects directly from Glenair — the recognized service, support, and availability leader for the interconnect industry. Hermetic-class MIL-DTL-38999 Series III connectors are also available from Glenair with DLA certification. These hermetically sealed connectors are ideally suited for harsh environments where the environment exists under vacuum and must remain free of air or gas impurities via the ingress of foreign chemical substances. Such systems may be susceptible to the condensation of corrosive material, dielectric breakdown and the loss of insulation resistance between conductors. Typical applications include medical, geophysical, military aerospace and other industrial applications. Marked with D38999 or Glenair COTS part numbering, these hermetic class receptacles are available for Series III and IV in box mount, jam-nut, solder mount and weld mount shell styles. All standard material and finish classes are supported including Y (CRES, passivated) and N (CRES, electrodeposited nickel). Contact arrangements per MIL-STD-1560. All standard and normal and alternate key and keyway polarizations are fully supported. Best of all, defense and commercial aerospace customers, as well as land and marine engineers and procurement specialists may specify these mission-critical interconnects directly from Glenair — the recognized service, support, and availability leader for the interconnect industry. 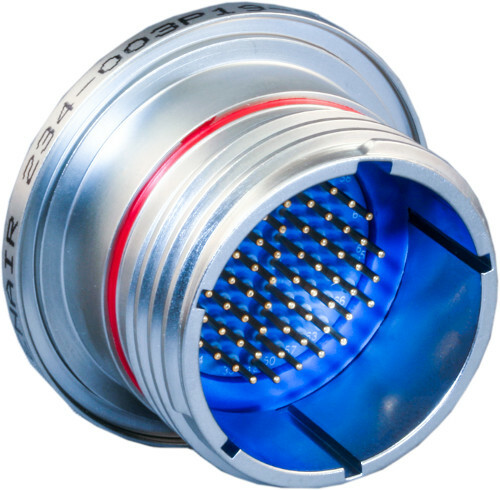 From vertical launch fire-control, tracking, and multi-target missile systems to rugged industrial applications such as mining/gas-pressure blasting, the Glenair's DLA qualified MIL-DTL-38999 Series IV connector is the ultimate solution for positive and reliable breech-locking connector performance. MIL-DTL-38999 Series IV plug and receptacle connectors are available in shell sizes 11—25, with MIL-STD-1560 insert arrangements as well as hybrid shielded contact arrangements. 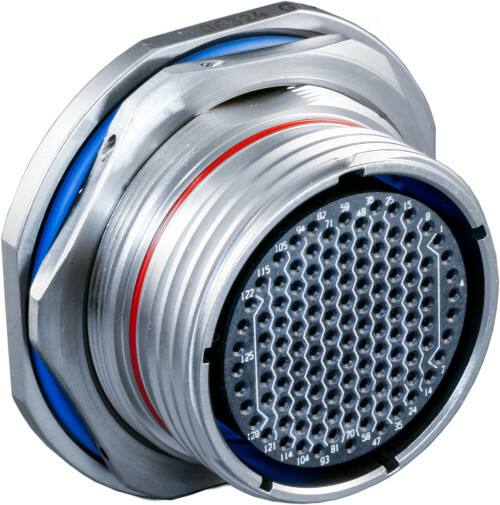 The heart of the Series IV connector is its coupling nut/locking technology which provides rock solid breech-lock mating augmented with both primary and secondary locking mechanisms. 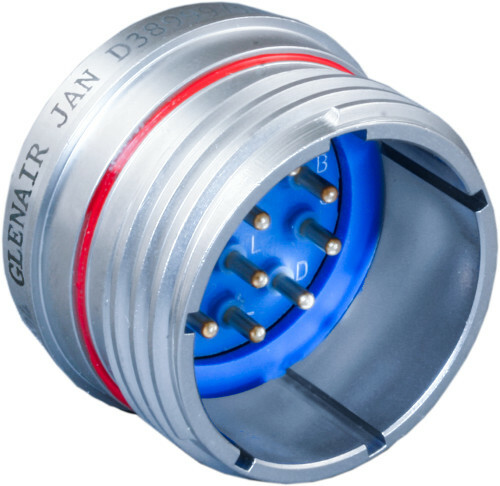 Environmentally sealed, EMI grounded, and outfitted with pin-to-pin mating protection to prevent circuit shorts and mechanical damage, Glenair MIL-DTL-38999 Series IV QPL connectors deliver unsurpassed reliability and anti-demating performance. Hermetic-class DLA certified MIL-DTL-38999 Series IV connectors from Glenair provide hermetically sealed breech lock connectors for high shock and vibration applications. Breech-lock systems provide robust engagement augmented by an internal mechanical thread to ensure connectors remain mated. Glenair Series IV hermetics maintain seal integrity and prevent ingress of chemical substances or fluids in mission-critical vacuum environments where air or gas impurities can result in corrosion, dielectric breakdown, and loss of insulation resistance between conductors. Typical applications include medical, geophysical, military aerospace and other industrial applications. Marked with D38999 or Glenair COTS part numbering, these hermetic class receptacles are available for box mount, jam-nut, solder mount and weld mount shell styles. All standard material and finish classes are supported including Y (CRES, passivated) and N (CRES, electrodeposited nickel). Contact arrangements per MIL-STD-1560 and both normal and alternate polarizations are fully supported. 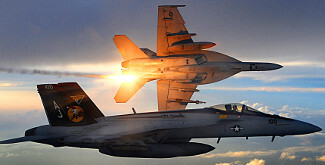 Best of all, defense and commercial aerospace customers, as well as land and marine engineers and procurement specialists may now specify these mission-critical interconnects directly from Glenair – the recognized service, support, and availability leader for the interconnect industry.